The site is located in a rural area 0.84 kilometres North West of St Brides Super Ely and 3.5km South of Creigiau. 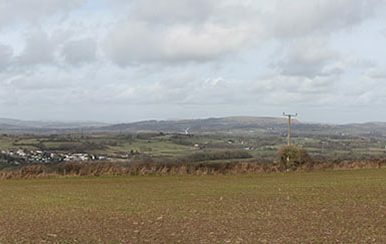 The site is bounded by the M4 motorway to the north of the site and agricultural farmland to all other boundaries. The owner of the land also resides at The Grange. The farm is located 434 metres East of the proposed turbine location. A public right of way runs close to the turbine site. A risk assessment has been carried out to determine the potential risk of this turbine. The proposed wind turbine (EWT DirectWIND 54 500kW) has an impeccable safety record. blade failure, rotor failure or tower failure for an EWT turbine anywhere in the world. The proposed turbine at The Grange farm has been sited to avoid impact on the PRoW and would not cause any risk to footpath users. There would be some limited disturbance to the PRoW during the construction and decommissioning periods, whereby the PRoW would be temporarily diverted in the interests of public safety.